Parking is available in a city run garage with direct and covered connection to the Hotel. Valet is available. Our menu is a celebration of community effort and our local producers raising food, brewing beer, distilling spirits and making wine. Our bar and restaurant blend seamlessly, creating an open, action packed and lively scene. We feature trivia on Mondays, jazz on Wednesdays, and a rotating cast of Burlington's best known musicians on Friday and Saturday nights. Patrick is a great server -- friendly, attentive and excellent recommendations. The food here was so good we came back again the next night and ordered one of the same dishes and the same dessert. The chicken drumsticks are the best drumsticks I've ever had and the coconut cake is amazing - great recommendation from our waiter the first night. The two cocktails I had were great as well, just a little pricey which is my only critical feedback of this place. Everything else was awesome! A favorite place for us! The menu keeps some old favorites (like the nachos!) and regularly updates with seasonal items (like the veggie rueben with corned beets), as well as delicious specials. It is always comfortable with great service and fantastic cocktails. I believe Juniper could be a good place to eat; but it seems like we had a lot of bad luck. First problem was after being seated. I was directly under an incredibly bright light that wasn't aligned to the table properly, it was like being under a spotlight. It seems minor but it was incredibly distracting, I could have used a baseball cap. Then the food came. My steak was incredibly tough. About a third was inedible due to it being so sinewy. I could actually not cut through portions with a steak knife after several attempts. Again seems like bad luck; I got a bad piece, but maybe they should be checking for the quality of the steaks. My date's vegetarian shepard's pie wasn't quite so bad; but did contain under cooked vegetables that seems to vary quite a bit. Our server also never asked us if we could like another drink, and we were ignored after first getting our food. Overall it was incredibly disappointing, because Juniper gets great reviews and I think has a lot of potential. Luckily we dined at Hen of the Wood the next night and experienced an amazing meal and service. Everything was great...we especially liked our waitress who was lovely. I had the lentil Shepard's Pie and it had so much rosemary in it that I could not eat it, at all. The Burgers were also very small for the price. 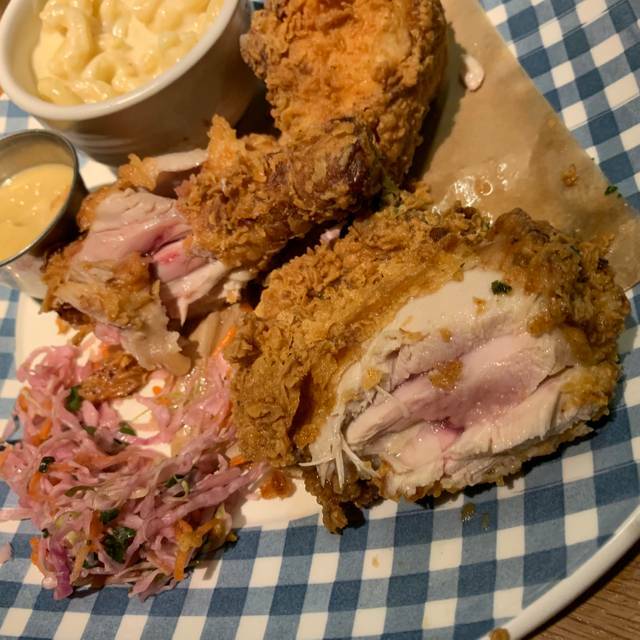 We are Vermonters and foodies at that, so we tend to always go for these types of restaurants and we were definitely surprisingly disappointed in the food at Juniper. Hosts and wait staff were great! Great service, good food but there were a number of fruit flies flying around the table for the entire meal. Delicious, imaginative food: we had roasted carrots with pistachio hummus, fabulous leek and mushroom tart, and chicken roulade that was lovely. Very nice waiter, who was knowledgeable about wine and told us a lot about the Vermont-produced wines they serve. Peculiar place for a restaurant but outstanding service and very welcoming. Unique choices on the menu and drinks that have a twist. Awesome. Thanks for being so accommodating with the changes to the reservation due to the weather. Food and service was outstanding! Mushroom and leek tart was delicious, salad was on point and the steak delectable. The finale cheesecake with berry compote was the perfect finish. Had a wonderful meal at Juniper and our waiter Jonah was exceptional. Highly recommend. Love love love everything about it. Stupendous food and service. Thank you to beer concierge and wonderful waitstaff. Food and service always are good at Juniper, and our dinner experience this time was also very good. I loved the atmosphere. Sophisticated in a Vermonty sort of way. I didn’t care for the menu very much. A mediocre strip steak served with roast cauliflower, was all just ok, I could have done better myself at home. Cheesecake for desert was the smallest cheesecake I’ve ever been served in a restaurant, and it wasn’t very good, the graham cracker crust would have been better were it not sitting in a puddle of raspberry juice. I’m in no hurry to go back. What a classy, upscaled experience! Great atmosphere, knowledgeable and friendly staff, amazing food. Need I say more? Okay, once we finished dinner we listened to a really cool live band that was actually at anvolume you could still comfortably speak with each other. We were here for a night's celebration of my husband's 71st birthday. We had an extensive and creative breakfast menu and we enjoyed the food and the ambiance. Our server was very helpful and knew just when to approach us with offers of help. We love juniper. Thanks for a great family dinner. Patrick was excellent! Couldn’t have asked for a better experience. Restaurant was gorgeous yet rustic. The ambiance, menu and service were consistent - kind of a creative, upscale, funky vibe. The food was epic, as was the service. Jonah? was approachable and attentive. I’d give you 6 stars if I could. Amazing service, good food & drink menu, fun seating around a fire! Excellent food, very knowledgeable waiter when asked about types of wild mushrooms and other aspects of the meal. Usually awesome, this night steak was nearly unchewable. Raw biscuits and fennel barely a roasted veggie. So sad but many visits and this was the only time it was just not good. Service Mars a decent restaurant. A nice menu at prices that are a bit high is my bottom line. High point was the nachos, which are not the typical greasy affair. Low point was the inattentive waitress. We ordered the same small plates selection as on our previous visit but the experience was substandard. In particular, the chicken wings were exceptional last time, tasted as if they had been reheated from a previous cooking. They were dried out & the glaze was not sticky as expected. OpenTable reviews looked great so I decided to try this restaurant. 1) The menu on OpenTable does not match the restaurant’s actually menu. 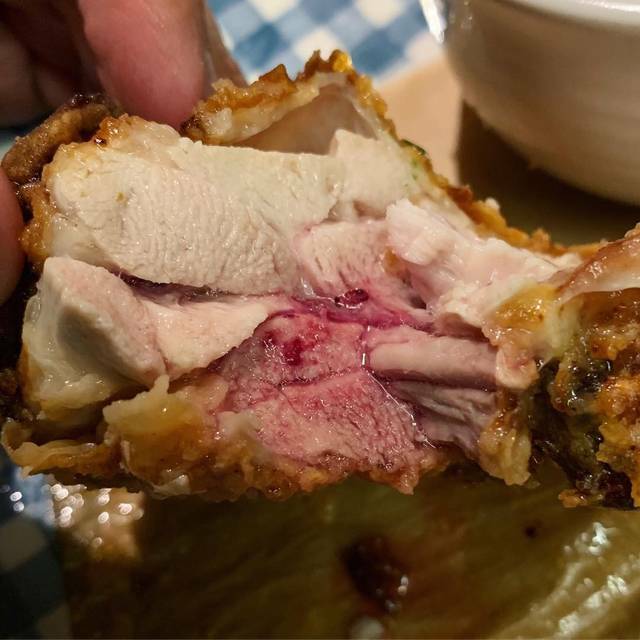 2) I ordered the fried chicken and two of the three pieces were raw. My waitress was super apologetic. I told her it happens. I’m not mad. 15 minutes later she brought me a new plate, but that order of fried chicken was also raw. $29 + $6 tip for raw chicken. My son and I had the turkey with dumplings. It was served in a lightly spiced sauce that was delicious. My wife had the turkey sandwich which was also very good. 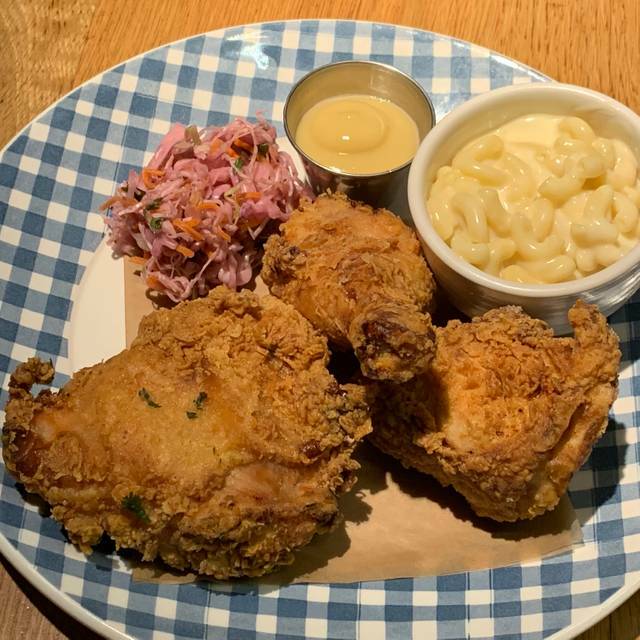 A friend had the delicious fried chicken. Every thing was presented in an interesting manner. Our server was great. He was not overbearing but around if he sensed we needed something. Overall, a disappointing experience, considering that other positive reviews contributed to my selection of this restaurant. The dining area was a small nondescript area capable of seating 26 people, immediately adjacent to the bar area. Absolutely plain furniture and no wall art or decorations. Only 6 people were eating dinner, compared to about 50 people in the noisy bar. Most good restaurants we ate at in Vermont had no problem filling the tables with customers. Although the food was good and the waiter was knowledgable, the wine list was very limited for a fine-dining experience. As a final comment, no bread was served with the meal- unheard of in the State of Vermont! We have dined here before and they never disappoint. Food is creative, local and tasty. Service is always friendly and efficient and I highly recommend Juniper. Great food and our waiter was excellent and knowledgeable about the menu. We loved our food, and loved the service! However, we had a gift card for two free entrees and when the server brought our bill to us (with the two entrees comp’d) it started to get awkward. We had planned to tip on the full amount of the bill (entrees included), but when the waitstaff stood to watch us leave, and then all walked over to see how much we tipped we felt extremely embarrassed. Again, we tipped $15 on a $25 bill, and had planned on it (because who wouldn’t) but it was extremely awkward. The service was great, food is always good - but save that awkward stuff for the back of the house/away from guests. It was uncomfortable. Best burger I've ever had. The cheese on the charcuterie plate wasn't ripe but the boar sausage was delicious. They serve Alchemist beer. And did I mention the best burger ever?! Burlington has a great food and beer scene so you have to be good to survive. As hotel restaurants go, this is one of my favorites not only in Burlington but anywhere. Hotel Vermont has a great vibe and this bar and restaurant doesn't disappoint. Breakfast's are outstanding and I would recommend starting your day here. There are plenty of things on the menu but go with the pancakes or the breakfast burrito. Dinners are great too because you have the option of a burger or a sandwich.....or a full dinner entree. Great patio for pre game drinks. Oh yes, the drinks here rock!!!! My wife and I visited Juniper Restaurant for our 42nd anniversary and we certainly enjoyed the experience. Because it was our anniversary, which I noted on the online reservation, our waitress brought champagne to our table, which was very nice. The staff were very friendly and nice, the food was very good. We had the steak dinner for two and it was tender and perfectly done. The one shortcoming, and it might have been due to the early hour--our reservation was for 6:15--was that the noise level was a bit higher than we would have liked. Still, I consider that a minor drawback in light of the overall very positive experience. Very good. I’d go back. Excellent food, short but well chosen wine list. Our waiter was knowledgeable and offered to cool our gam at wine which was just the right thing. Interesting menu in a friendly atmosphere. We like to meet friends here and have always felt welcome to linger in conversation. Nachos were fantastic! Fried chicken was very good, pollack was delicious. Server was terrific! Key lime tart was mediocre: bland flavor, no contrast in texture. We did not finish it between the two of us...would not order it again and we LOVE key lime tarts/pies. The food was delicious and top notch, so were the drinks! Lovely setting, but noisy.